Historical linguistics investigates the history of language(s). It thus tries to trace the origins and changes of/in individual languages/dialects by comparing their common, as well as different, features to see how they have developed over time. It is thus essentially a diachronic discipline. In the context of English historical linguistics, we are mainly interested in the relationship of the English language to other (mainly Indo-European) languages, as well as how English has developed from a predominantly Germanic language to its current state and which changes modern English is undergoing at present. All languages change continually, due to various influences, such as (im)migration, language contact, personal preferences, the influence of the mass media, etc. This kind of change can occur on three different levels, that of lexis, that of morphology & syntax, and that of sound. In lexical change, new words can be incorporated into the language or ‘old’ ones ‘drop out’, which essentially means that the size and composition of the vocabulary may constantly be changing. Furthermore, lexical items may also change with regard to their semantics in different ways. They may either change their original meaning completely, and thereby usually become opaque, or undergo processes where their meaning becomes more or less positive. A classic example for an amelioration (i.e. an ‘improvement’ of meaning) is the word knight, which is related to Ger. Knecht, and originally referred to a young servant, but later became a term used for a nobleman. More modern examples would be the words wicked or terrific, which used to have only negative connotations, but have both acquired the meaning of ‘extremely good or interesting’, especially in the language of younger speakers. A change in meaning or at least a restriction thereof can also often be found in the collocations a word enters with over time. For example, the adjective handsome used to be relatively flexible in its application to a variety of nouns/NPs, such as book, sum of money, steed, lady, etc. These days, however, its use is almost solely restricted to nouns that describe male humans, and any use of it in conjunction with either a girl or a woman would seem distinctly odd, even though only one or two hundred years ago, this would have been perfectly normal. On the level of morphology & syntax, changes often also result in a change of language typology. For English, as we shall see below, this entails a change from a highly inflected language, that is in many ways still very similar to German, to a mainly analytic/isolating one. Perhaps the most striking effect this has had on the English language is that modern English is far more dependent on a rigid constituent order than German because almost all case markings have disappeared. Any learner trying to acquire English will soon notice that the grapheme–phoneme correspondences in modern English are very far away from an ideal 1:1 relationship. However, in earlier forms of English, this used to be much more the case. The situation as it presents itself in modern English is due to a number of sound changes English has undergone over the centuries. The most important of these is called the Great Vowel Shift, and it began sometime towards the end of the Middle English period (1150-1500). It was during this period of change that some of the originally long (Germanic) vowels became diphthongs, so that e.g. the original pronunciation of time as /ti:mə/ became /taɪm/ and /hu:s/ (house) /haʊs/, etc. Further changes in the pronunciation of vowels where the phonemic split of /ʊ/ into /ʊ/ and /ʌ/ in the Southern accents of England, the merger of <ea> & <ee> to /i:/, and the gradual elimination of final unstressed <e>, formerly pronounced as shwa as in time above. In order to illustrate some of the features of language change over time, we will take a very brief look at the different periods of English and point out some of the relevant differences/changes. Although the diversity of different dialects in English these days is very high, due to the fact that there are certain (more or less) recognised standards, this diversity is no longer as important as it used to be in older forms of English. In Old and Middle English, this diversity would have been much more important because it may have caused major problems in communication between people from different areas. 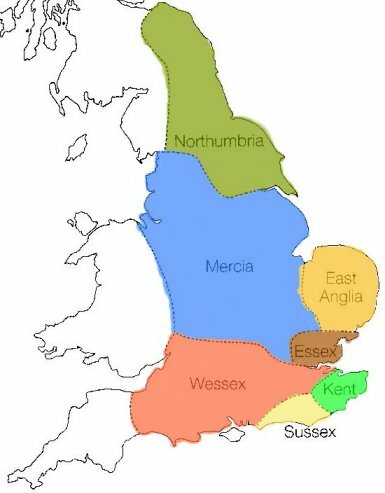 The map below (adapted from Trudgill, 1990) shows the Anglo-Saxon kingdoms about a hundred years before the ‘official’ start of the Old English period, which gives us some idea about the different dialects spoken in England around the time. Go through the two versions of the text below and try to identify what the modern English correspondences of the words would be or whether you can identify if there are any archaic (i.e. ‘old-fashioned’) forms you may be familiar with. In order to detect familiar words, sometimes you may simply have to replace some letters or move them around to arrive at more modern forms, or remove some of the endings, while in other cases, you’ll have to do a little more detective work. In order to help you a little, I have included some tooltips in parts of the text in the left-hand column, which you can find by carefully moving the mouse pointer over the text. Before getting this help, though, as usual, first try to identify as much as possible yourself. As you can see, although these two dialects are fairly distinct, they nevertheless share a common Germanic core, so that their language sometimes seems even more German than English, especially if we ‘shift around’ a few of the letters or replace them by modern variants. What is immediately obvious, too, is that we have some additional letters, some of which look remarkably like the ones we use as phonetic symbols theses days, although they did not always have the same qualities. These are the æ (ash), ƿ (wynn), þ (thorn), ð (eth) and the ӡ (yogh). Another very important feature is the strongly inflected nature of the two dialects. Towards the Middle English period, dialect diversity increases, so that often communication between people from different areas would have become even more difficult until standardisation of the written language began around the time that Caxton introduced printing in England in 1476. In order to illustrate the diversity, we’ll first have a brief look at some quotes from the period and then present two more examples of Middle English literature, one from the area of the (Northern) West Midlands and one from Geoffrey Chaucer’s Canterbury Tales. Englischmen, þeyӡ hy hadde fram þe bygynnyng þre maner speche, Souþeron, Norþeron, and Myddel speche, … noþeles, by commyxstion and mellyng furst wiþ Danes and afterward wiþ Normans, in menye þe contray longage ys apeyred, and som useþ strange wlaffyng, chyteryng, harryng and garryng, grisbytting. Al þe longage of þe Norþhumbres, and specialych at ӡork, ys so scharp, slytting, and unschape, þat we Souþeron men may þat longage unneþe understonde. Try to understand the language of John of Trevisa as much as you can and see whether you could translate it into modern English. What are the reasons for the change in the language, according to him? With rych revel oryӡt and rechles merþes. With lordeӡ and ladies, as levest him þoӡt. That dwelten in this halle, of which I seye. Fer in the north, I kan nat telle where. With good swerd and bokeler by hir side. Aleyn spak first, “Al hayl, Symond, y-fayth! “Aleyn, welcome,” quod Symkyn, “by my lyf! Compare the language of the two extracts. To help you understand the text a little better, you can use the MED Lookups facility at Michigan University. Which one do you find easier to understand and why? The Early Modern English period is mainly known as the age of authors such as Shakespeare and Marlowe. By their time, we already find a much greater standardisation than before, at least in writing. The following excerpt from Christopher Marlowe’s Doctor Faustus illustrates some of the main points of interest. Try to identify and describe the features of the above text (ignoring the Latin bits) that make it different from modern English using your knowledge of morphology, syntax, and phonology/graphology. Trudgill, P. 1990. The Dialects of England. Cambridge: Blackwell. Strang, B. 1970. A History of English. University Paperbacks. London: Methuen & Co, Ltd.